There is a push to increase organic Nendran banana farming in Trichy climate that can support Nendran banana production. Bananas are grown in 119 countries and among them; organic banana farming is becoming more popular. One method of organic banana farming uses naturally occurring, environmentally friendly microbes feasting on a vegetable mash made up of a variety of cooked grains, letting them ferment. To this mash is added a variety of nutrient-rich materials: charcoal, molasses, milk, chicken manure, forest soil, pig feed, and over story leaf litter. This mixture is moistened and allowed to compost for eight days. Two handfuls of this compost are put at the base of each transplant. Combine this with careful leaf pruning, topsoil cleaning and periodic enrichment with the mash compost aids in good, clean banana tree growth. Organic bananas are for "long term" benefits with Nutritional value, the long term benefits to the customer are the same for the organic banana farming community: safe products from a healthy ecological environment. The market for organic bananas in the state of Kerala is increasing at over 10% a year. And even though the cost of an organically grown banana is slightly costlier than cost of a non-organically grown banana, sales and sales growth continue.Sirugamani Kalanjium treat earth well, to make sure that they have enough plants producing oxygen for them and many generations to come, to help bolster organic banana farming and farmers. ‘Mr.B.Nair motivates others’ Get up and go buy an organic banana today. You are helping the world by helping yourself first’. 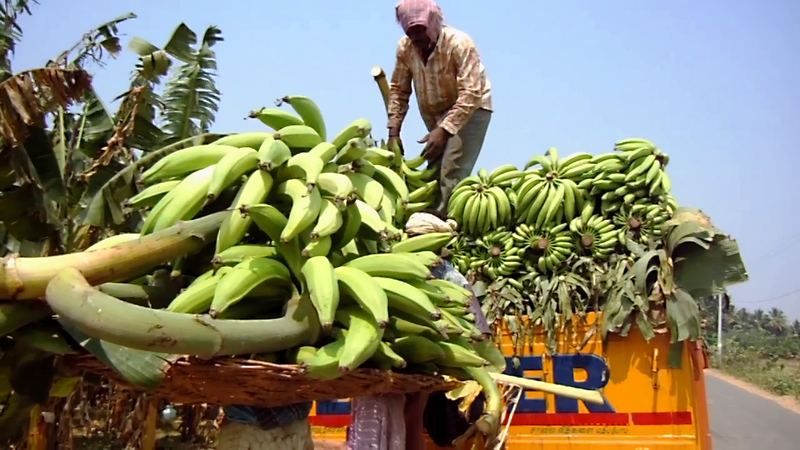 After emerging as the first Indian farming company to export bananas from India, Navsari-based Desai fruits and vegetables (DFV) now plans to bank on ‘organic bananas'. Considering the huge demand for organic bananas in the overseas countries, DFV has set the ball rolling to grow organic bananas of export quality. It gives hope for Kalanjium area farmers to grow organic farming seeing the initiatives of Desai fruits and vegetables for exporting Organic bananas. As part of the pilot project, Kalanjium has already identified 20 acres of land for carrying out the field trials. Kalanjium has entered into contract farming agreements with farmers to get 20 acres of land. The first harvest has come out and they send these Nedran Bananas to Kerala for consumption. We have planted and harvested organic nendran bananas for the first time," said Pichaimani an associated farmer of Kalanjium. After the trial cultivation, the Kalanjium will cultivate organic bananas in a big way. ‘We have to spend great deal of time in cleaning up chemicals from the land to grow organic food. It will atleast take two years for Kalanjium to kick off organic bananas on large scale," said D.Latha, coordinator of the farm, which apart from bananas also market sweet potatoes and organic paddy and vegetables in Trichy." So far, Kalanjium has sold 300 tonnes of Nendran banana to Kerala’. ‘The price of the ‘organic nendran' variety of banana gets the spot price touched a record Rs.29.50 a kg at the Meenangadi, a major market in Kerala, the price was of inorganic Nendran Banana was Rs.14 in this year. As far as production wise is concerned, the quantity produced in chemical farming is 25%, more than the organic farming but the cost of each kilo is higher for organic banana and overall the first crop the return on investment is equal for both organic and chemical Nendran cultivation, the only advantage of organic farming is that the banana is natural and the land is maintaining its fertility as we use vermi and farm yarm manure’ farmer Pichaimani argues.-Etram News Service.